We are excited to introduce our latest template for Adobe Captivate (Available for Captivate 5, 6 and 7). The Adobe Captivate Streamline template provides a fresh clean design that is perfect for your next project! 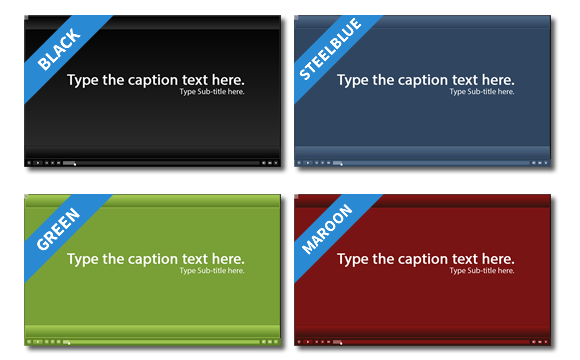 Each color can represent a difficulty level for your content, for example the Steelblue template can be used for Introductory courses, Maroon for Intermediate, Green for Advanced level courses and Black for assessments. Everything You Need To Quickly Build A Course! 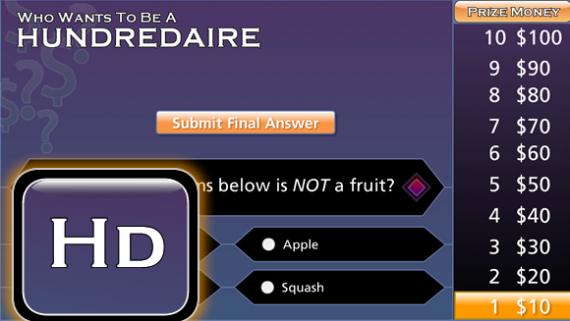 This template comes with a Captivate Template File (.cptl file) that comes pre-built with 20 slides, including a quiz that contains each of the main question types, so the basic shell of a course is already created for you. 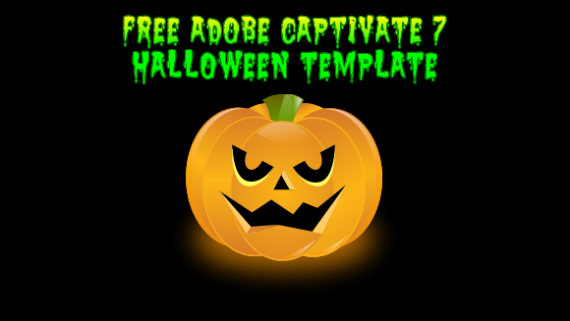 You also get a Theme file (.cptm) if your purchase the Captivate 6/7 template. 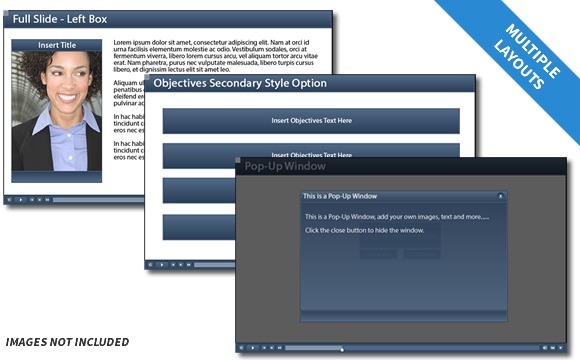 This template also includes an intro music file, matching Flash arrows and User Interface Elements to create pop-ups and hint boxes which can be found in the library. 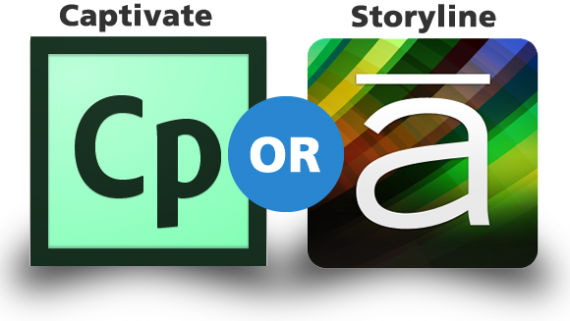 This Adobe Captivate Streamline Template comes with multiple slide layouts. They give you the perfect backdrop for your images, text and videos. 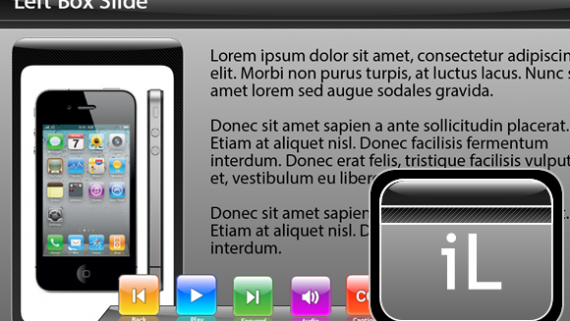 Easily add new slides by simply selecting a slide layout. 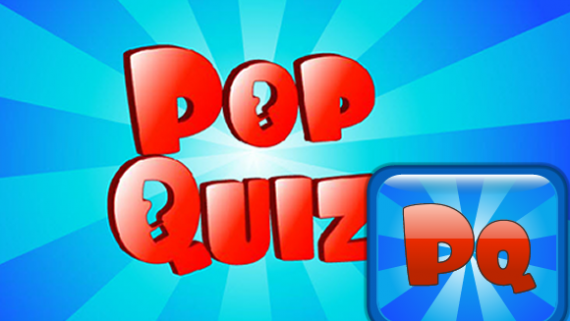 Each of the main quiz question types is also pre-configured to save your even more development time. The Streamline Template also includes a matching Player Shell style and over 25 matching buttons (already formatted with normal, hover and down states). Simply insert a button and select the Streamline template style to apply the matching button. You also get matching styles for your Captions and Smart Shapes. This will tie in with the colors of your slide layouts to give your project a professional finished look. 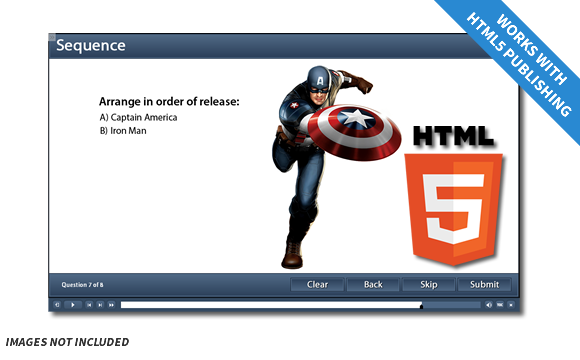 The Streamline Template is ready for publishing to HTML5. We still recommend publishing to Flash for the best user experience, but if you are looking to deliver courses via HTML5, this template will work nicely for you. Start Building Courses Better and Faster! 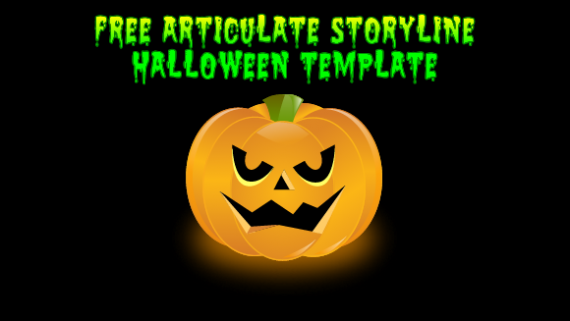 This template will definitely save you time, allow you to focus more on developing the instructional content of your projects and is a GREAT value. 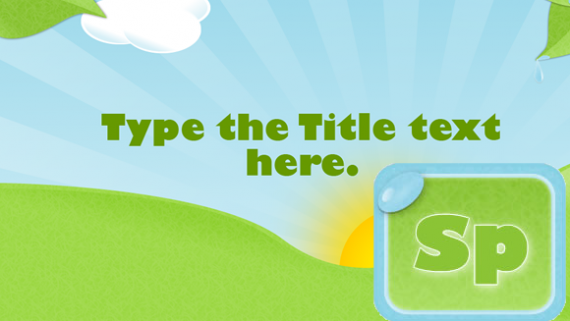 View the templates in our store now to see published samples of each template color. 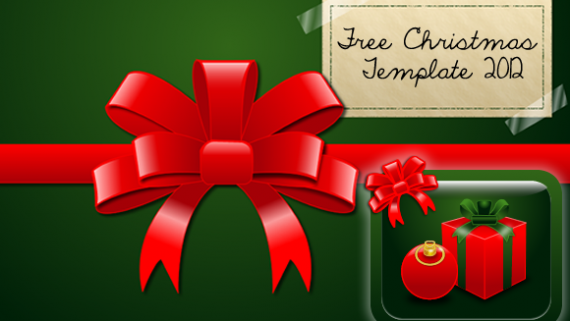 Available now in single templates, or for the best value, purchase the 4 pack!